As viewers of my sculpture work can tell, the movie left a lasting impression on me. Fifty years later I am still dreaming about marching bands and brass instruments. I didn’t know Mason City was “River City” until a few years ago when I received a call from a representative of Sculptures on Parade. She was inquiring about a sculpture I had made for Castlegar Sculpture Walk, “Kinetic Weather Disturbance”. “Can we transfer your sculpture to Mason City Iowa to be part of Sculptures on Parade”? she asked. And then added, “Mason City is the home of the Music Man”. I jumped right out of my skin! Well yeah, sure, please and thank you. Kinetic Weather Disturbance went on to win best in show and was purchased later that year and donated back to the city. And that’s how I was connected to Sculptures on Parade in Mason City Iowa. It couldn’t have been better. So to make a long story even longer, let me tell you a little bit about the making of the sculpture ‘76 Trombones’. I dreamed up the idea while I was traveling to somewhere and later scribbled a likeness of the Idea in one of my note books. The idea percolated in my head for a year or two then I mustered up the courage to build it. 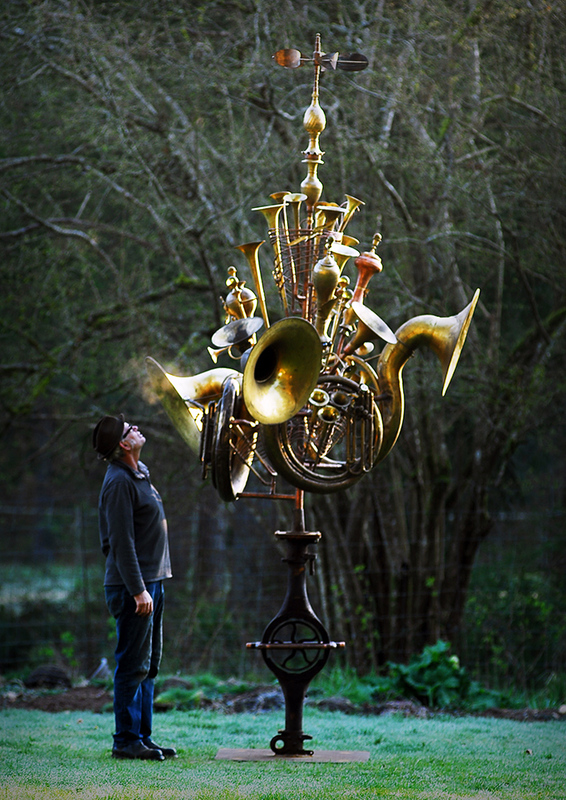 I had all the defunked instruments I needed hanging up in my studio; so I pulled them down and stared the process of making my dream piece, Seventy-Six Trombones. I am so impressed with the efforts of the citizens of Mason City to fundraise to keep the sculpture in town. Special thanks to Jack Leaman and Robin Anderson for getting the ball rolling. I would be so proud to have ‘76 Trombones’ as part of the permanent sculpture collection ‘right here in River City’.